Free Astrology Advice – Horary Astrology: Will I Marry, When, and Whom? My question is simple; when will I get married and what will my husband be like? Perhaps the leading advantage of horary astrology is that we need so little background to give an accurate judgment. Most of my readers write to me with a fair amount of background information. But, we can just as easily make a prediction given little more than the question itself. One does not need a lot of background to answer “when will I die?” Similarly, we need little background to answer when one will marry. It helps to know the person’s age to see whether the odds are strongly for or against them marrying. Since most of the people who write to me or under 35 and definitely under 40, I will assume that you, A., are no older than that. You are shown by the ruler of the first house, Mercury, shows your personality and your mental approach to the whole situation. The Moon shows your emotions, while Venus shows your biological urge to find a mate, or to marry. Marrying is the primary urge on your mind, as we see that Venus is just outside the first house. 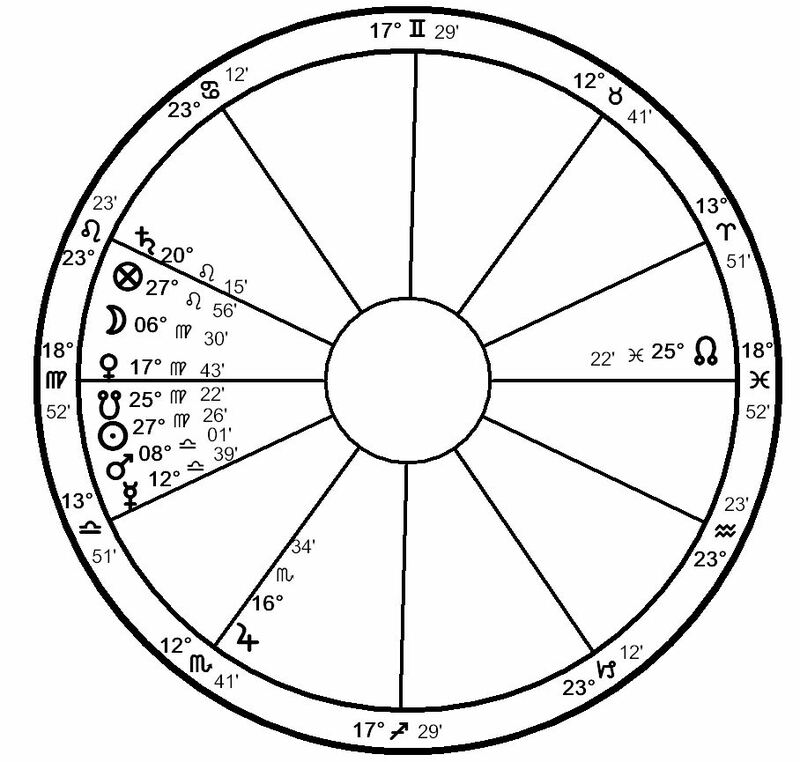 However, Venus is in its fall and in detriment of Jupiter, Lord of the seventh house of partners. This makes me think that while your biological clock is ticking, you are not thrilled with having to do with an actual flesh and blood male to marry. The fact that the Moon is also in Virgo, underscores this, and makes we wonder if you’ve recently had some kind of heartbreak that turns you off of men for a while. And the fact that Venus has recently sextiled Jupiter, Lord of the seventh house of partners, with really bad mutual reception, again makes me think you just underwent a nasty breakup. Even more problematically, the further difficulty here is that both the Moon and Venus are very interested in Mercury, which is you. I have yet to see anyone find a spouse or significant other where the significators are primarily interested in themselves. You have to be willing to get out there, take a risk, and focus on the other person. Now, your horoscope does not seem predisposed against marriage, but you’re definitely not in a place right now where marriage seems likely in the near future. The Moon will sextile Jupiter in about 10°, which can indicate a potential time of marriage. However, I am skeptical about this, because both the Moon and Jupiter are in cadent houses, from where they cannot easily act. Moreover, they are in very bad mutual reception, showing that you and the potential partner actively dislike each other. Does this mean you will eventually marry your ex-sweetheart? Perhaps, but I would strongly advise against it. 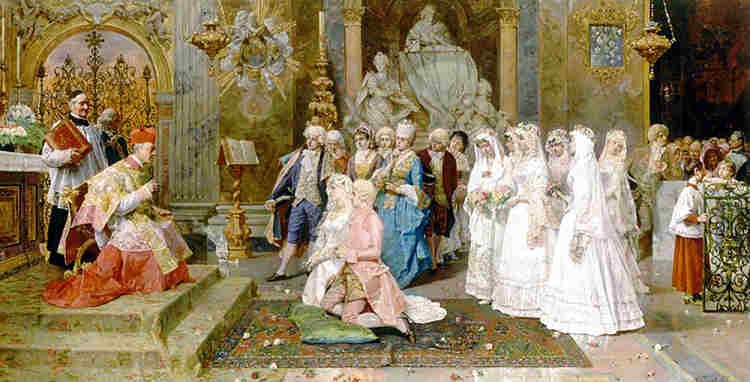 If this aspect he does indeed bring marriage, which I doubt, we are looking at a few years before you get married. Because Jupiter is cadent and in a fixed sign, we would look toward a longer timeframe. Months seems a little short, while years seem a little long. Depending on your age, however, 10 years with a little smidgen added because the Moon is in a double sign, may do it. More likely, however, the horoscope is saying that for the foreseeable future, you will be no condition to marry because of your past experiences. I would highly recommend that you take some time out to heal yourself and reconsider your whole approach to marriage. I’m a firm believer that you get back what you give, and if all you have right now is the propensity to lick your wounds, the men are unlikely to come running. Any relationship resulting from this would likely not be very auspicious. —To all readers: If you wish to schedule a private consultation with Nina Gryphon, you may contact her at nina@gryphonastrology.com.